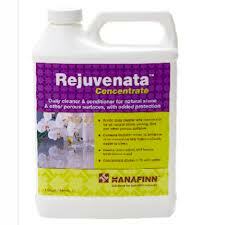 Dry Treat HANAFINN Rejuvenata Active marble floor cleaner is an active enzyme cleaner concentrate for natural stone including polished marble, tile, grout, brick and other hard surfaces. Typical applications: HANAFINN Rejuvenata™ ACTIVE is suitable for a wide variety of applications, including building facades, floors, walls, swimming pool surrounds, patios, garages, kitchens and entertaining areas. Benefits: HANAFINN Rejuvenata™ ACTIVE contains 3 types of natural active enzymes that quickly break down oils, grime, food residue, bacteriae and mold. It is environmentally responsible and safer to use than many traditional chemical cleaners. Pour 1 part Rejuvenata Active™ to 40 parts clean warm water into a bucket (1/10 quart Rejuvenata Active™ to 1 gallon / 4 litres water). Stir for a few seconds. More soiled surfaces may need a higher concentration - 1 part Rejuvenata Active™ to 20 parts water (1/5 quart Rejuvenata Active™ to 1 gallon / 4 litres water). In light concentrations, the cleaner should not leave a residue or need rinsing with fresh water. Pour 1 part Rejuvenata Active™ to 10 parts clean warm water into a bucket (2/5 quart Rejuvenata Active™ to 1 gallon / 4 litres water). Stir for a few seconds. Generously apply to the surface and leave for a few minutes to allow the enzymes to start breaking down the dirt. Rinse thoroughly with clean water and a mop (inside), hose / pressure washer (outdoors). Pack size: One Quart (946 mL) container.